Over the past few weeks, I've been updating my portfolio. The good news is that I locked in a gain with NVDA by selling 100 of my shares for $212 per share, which I had bought at an average price of $25 about two years ago. The bad news is that I lost money on other investments. I sold shares in a few stocks that had declined in price and didn't seem to hold potential for gain even when priced low. The good part of my bad moves is that I've honed my ability to know what not to buy when investing. My portfolio evaluation reminded me of advice from billionaire investor Warren Buffett: “Don't lose money.” This gem of investing wisdom sounds overly simplistic. And while it could be considered too simple, it's still excellent advice. Devising a plan to NOT lose money is just as important as crafting one that could produce great returns. Let's say I buy the stock of a great company but pay too much. In this scenario, we'll say the share price is $50 when I buy 10 shares in Year 1 but falls to $25 in Year 2 when earnings don't grow at an astronomical pace as predicted. The value of my holding drops from $500 to $250. I still like the company and hope it'll grow at a rate of 15% per year and its price will increase steadily at this same rate. Theoretically, I could buy more shares at this better price of $25 but in my made-up scenario, I don't have any extra cash. As far as the growth rate, I know this assumption is a leap of faith but my goal here is to illustrate a point: getting over a loss takes a long time even under the best conditions. Buying a high-yield bond to get just one or two percentage points more than what's available through an investment-grade bond isn't worth the risk of principal loss in Graham's opinion. However, if bonds can be purchased at a discount, Graham makes a exception for the inclusion of high-yield bonds in a portfolio. More specifically, he suggests pricing of 30% under par for high-coupon bonds and less for low-coupon bonds. Investors can make money on new issues. However, those who tend to benefit most from IPOs are institutional investors and/or high net-worth clients of firms who orchestrate public offerings. These investors can buy shares at true introductory prices, improving the chances of making money on the deal. The rest of us may find ourselves paying much higher prices just a few days after the stocks are introduced to the market. As far as what I plan to do differently, I'll be more cautious with growth companies. Beyond a basic valuation and a healthy margin of safety, I'll require several years of earnings growth, not just a few. I'll avoid hot-stock buys during a period of market highs and show caution with stocks that are being heavily shorted (that is, when lots of people are betting that the price will go down). Admitting that I had failed in the don't-lose-money rule was hard. But I made things worse by holding onto losing (and loser) stocks. I increased my losses by thwarting gains in the future (that is, not selling and reinvesting the proceeds sooner). Oddly, I had identified candidates to unload but was ambivalent and anxious about pulling the sell trigger. Eventually, I decided to let the numbers tell me what to do. To kick off the process of nailing down what to keep and what to sell, I updated my stock valuations. Then I compared current prices with what I considered fair prices for each company. My goal was to determine if any of my holdings had reasonable potential for gains in the near future. Some of my holdings aren't valued by the market as much as they should be IMHO and I plan to hang onto those for the moment. However, some of my past stock purchases not only declined in value but deserved these falls. They simply didn't deliver earnings or cash flow as expected. My number crunching confirmed my desire to unload these stocks and move on. Not every loss or setback can be predicted. But I'm getting better at not losing money and I'll offer the “don't lose money” maxim to other investors. Find ways to minimize losses in order to benefit more from gains. After locking in my losses and eliminating the possibility of further decline, my various accounts have grown in value. So, I'm already seeing the fruits of my decisions. 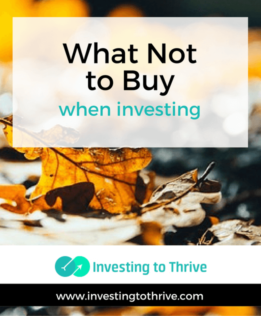 For too long, I've tried to ignore my investing mistakes. But I've learned that confronting my mistakes, or more accurately, dealing with under-performing selections, is good for my soul and my net worth. Next, I'll refine my list of what not to buy and focus on sticking with my list.